I often hear “mutation can’t create anything new, only damage” as a criticism of genetic mechanisms that supply variation in organisms. It’s not true, since there are so many mutations that some of them are immediately useful. But another mechanism of variation is gene duplication. Once you have two identical genes (“No new information,” chant the creationists), one of them is free to change into something else. It’s like hiring two waiters. Both of them may have the same job description, but one can take orders while the other fetches them, or lays tables, or ushers people to their seats. I want creationists to imagine one of those children’s activity tables where organizers pass out photocopied line drawings to be coloured. Do they imagine that all those duplicated sheets end up the same after the children are finished? Don’t they remember the walls of multi-coloured art based on the same picture? What makes them think evolution can’t do the same with duplicate genes? It is wilful stupidity. “Phil Plait gave a report to a sheriff by telephone. Michael Shermer told me he obtained a restraining order to ensure Mabus would stay clear of him. Canadian skeptic Steve Thoms and blogger Greg Laden also filed reports. There are no doubt others. PZ Myers filed a complaint (Time to Institutionalize Dennis Markuze). After many complaints during which the police did nothing, an e-mail petition finally got the Montreal Police off their duffs. “Mabus” isn’t the only Crazy Canadian by any means. And now I’m waiting to hear about Makuze’s next appearance in court. Lest we forget: science was denounced from the pulpit when it advanced a theory of the physical nature of electricity. 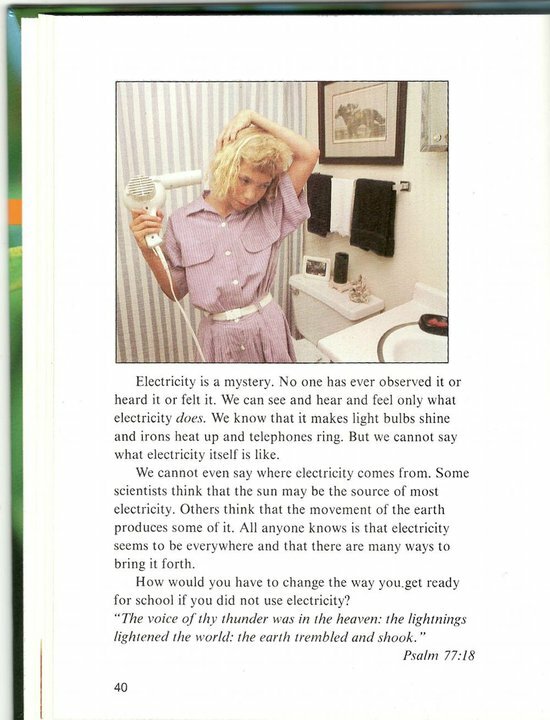 Electricity: According to this religious textbook, no one has ever observed it. Except for sparks. And lightning. And in Tesla machines. And as measured by voltmeters, ammeters, and ohmmeters. And as cathode rays and in cathode ray tubes, the screens of your televisions and video display monitors. And making heating elements glow in your stoves and electric heaters. And lighting up neon signs. And directly in plasma globes. But remember, children–Goddiddit! National Geographic’s 2009 roundup of transitional fossils included a fish that is evolving to lie concealed on the ocean floor. Modern flatfish are born symmetrical, with eyes an other side of their head, but as they age one eye moves around to the other side so that the fish can watch for danger with both eyes while lying flat on the sea floor. The lack of “halfway” forms has been used to argue against evolution. Now, one has been found. This one appears to have one eye just over the midline. I wait for anti-evolutionists to acknowledge that the theory of evolution has been confirmed once again: Amphistium, transitional fossil, a half-way flat fish. How much is a centi-Dembski? You may Have seen William Dembsk’s assertion, or repeated it, that he has proved that natural selection working on random chance is not an efficient way of generating mutations or that it’s less efficient than random chance alone. This somewhat nonsensical conclusion was supposedly proved by a computer program written by Dembski and Robert J. Marks. They put up an essay, “The Unacknowledged Costs of Evolution,” criticizing an evolutionary program called ev, on an unofficial web page. Unfortunately, obvious errors in basic computing make their results invalid. The errors were such that the program would never find a solution, such as filling a table with 1’s and then randomly changing some of the cells to 1’s and waiting for some zeroes to appear. With programming skills like those, they would wait forever. And then they used the wrong size of matrix, compounding their error. Wesley R. Elsberry has the details in an article called “Unacknowledged Errors in ‘The Unacknowledged Costs’” over on the Panda’s Thumb. It covers who was able to find the errors and why, what they wrote to the authors, what they did or didn’t do in response, what has happened when other errors were pointed out, and so on. In the badinage of the comments the standard size of a Dembski error was discussed and 65 orders of magnitude was calculated. That’s 1 followed by 65 zeroes. Someone else pointed out that creationists, in taking the age of the earth to be 6,000 years instead of 14 billion, were only 63 orders of magnitude off target–a centi-Dembski!